Please do not hesitate to contact us for further information or with any queries. Either by email webstore@martingrover.com or by phone 020 8671 2355. We make every effort to despatch your order promptly and you will receive your order within a few days. However shipping in the UK can take up to 10 days. Orders from outside the UK can take even longer. Please contact us directly if you require your order urgently and would want to pay for a faster service. We will do whatever we can to help. We primarily use Royal Mail to carry out delivery. Track your item with Royal Mail. 2. Paying with your credit or debit card. To proceed to pay with a card ensure that the ‘Email’ and ‘Password’ fields are EMPTY and then click the grey button: Pay with Debit or Credit Card, near the bottom of the box (as illustrated). Depending on your browser settings, the ‘Email’ and ‘Password’ fields can automatically populate. 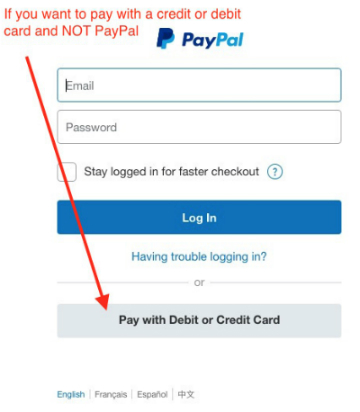 Please ensure that they are clear before clicking the grey button, otherwise PayPal defaults to trying to log you into your existing account or to setting up a new account. Once completed PayPal will email you a confirmation of your full payment. It will not show an item by item breakdown, however, the order confirmation that you receive from us will show this information. We fully appreciate your custom and have tried hard to fully represent our products faithfully on the website though appreciate that occasionally what is received is not what is expected. If for any reason, you are unsatisfied with your purchase we will give you a full refund (minus all shipping costs). If this is the case, please contact us and we will provide details on how to make the return to us. Please return prints in the protective packaging they came in. Our no quibble returns policy lasts for 30 days from your purchase. If 30 days have lapsed since your purchase we cannot offer you a refund or exchange. Once your returned order is received by us we will notify you by email. Once your return is inspected and approved, your refund will be processed, and a credit will automatically be applied to your credit card or original method of payment in a timely manner. This is a very rare occurrence but If your purchase arrives in poor condition please contact us to explain the issue. If there is damage to the product then send us some digital photos along with your order number and date of purchase and state whether you would like a replacement or a refund. You will be responsible for paying for your own shipping costs for returning your item. Shipping costs from the original order are non-refundable. Please consider using a trackable shipping service or purchasing shipping insurance. We cannot guarantee that we will receive your returned item. If your return does not reach us, or is damaged in transit to us, we cannot offer a refund. Thank you for browsing and please do not hesitate to contact us for further information or clarification. These Terms and Conditions apply to all use of MartinGrover.com and all transactions for the sale of goods on MartinGrover.com. Please read them carefully. They do not affect your statutory rights. All prices shown on MartinGrover.com include any VAT payable but exclude delivery charges. Although we endeavour to ensure that all pricing information on MartinGrover.com is accurate, occasionally an error may occur and goods may be mispriced. If we discover a pricing error we will, at our discretion, either contact you and ask you whether you wish to continue with the order at the correct price or notify you that we have cancelled your order. We will not be obliged to supply goods at the incorrect price. We reserve the right to adjust prices, offers, goods and specifications of goods on diy.com at our discretion at any time before (but not after) we accept your order. Please see the how to shop section for information on how to place an order. You will have an opportunity to check and correct any input errors in your order up until the point at which you submit your order by clicking the "confirm order" button on the check out page. All orders made by you through MartinGrover.com are subject to acceptance by us. We may choose not to accept your order for any reason and will not be liable to you or to anyone else in those circumstances. For certain goods, information concerning stock availability is not available on MartinGrover.com If you order goods are not available from stock, we will contact you by e-mail or by telephone to discuss how you wish to proceed. You will have the option to wait until the goods are available from stock, or cancel your order in accordance with our returns policy. The total cost of your order is the price of the goods and delivery charges as set out in delivery information. If you buy a product which we deliver to you, you may cancel your order (or any part of it) for any reason before delivery or within 30 days after delivery. Images are for illustrative purposes only and may not be precisely to scale or exact colour representations. E&OE. Faulty Products If the product you purchase is faulty, we may offer a repair, exchange or refund as appropriate in accordance with your consumer rights. Please call us on 020 8671 2355 to arrange. General Conditions We shall not be liable to you where performance of any of our obligations to you is prevented, frustrated or impeded by reason of acts of God, war and other hostilities, civil commotion, accident, strikes, lock outs, trade disputes, acts or restraints of Government, imposition or restrictions of imports or exports or any other cause not within the reasonable control of MartinGrover.com. MartinGrover.com will do all that it reasonably can to meet the date given for delivery. In the case of unforeseen circumstances, beyond the reasonable control of MartinGrover.com, MartinGrover.com may not be able to do so. In such circumstances MartinGrover.com will contact the Customer and agree an alternative date. The Customer will also do all that he/she reasonably can to enable the delivery to take place on the given date. In the case of unforeseen circumstances beyond the reasonable control of the Customer the Customer may not be able to do so. In such circumstances the Customer will contact SlipShop and agree and alternative date. As soon as MartinGrover.com has delivered the goods, the Customer will be responsible for their safekeeping and MartinGrover.com will not be responsible for any damage or fault arising from incorrect storage. If the Customer delays a delivery, MartinGrover.com's responsibility for everything other than damage due to its negligence will end on the date MartinGrover.com agreed to deliver them as set out in the contract. Ownership of the goods shall remain with MartinGrover.com and shall not pass to the Customer until the agreed price for them, together with all other sums due from the Customer to SlipShop, have been paid in full. To the extent permitted by law, MartinGrover.com accepts no liability for any loss, damage or injury arising as a consequence of the advice provided. MartinGrover.com is committed to ensuring that your privacy is protected. Should we ask you to provide certain information by which you can be identified when using this website, then you can be assured that it will only be used in accordance with this privacy statement. MartinGrover.com may change this policy from time to time by updating this page. You should check this page from time to time to ensure that you are happy with any changes. We may collect the following information:name and job title, contact information including email address, phone/fax number, company information demographic information such as postcode, preferences and interests, other information relevant to customer surveys and/or offers. We require this information to understand your needs and provide you with a better service, and in particular for the following reasons: Internal record keeping and accounting purposes. We may use the information to improve our products and services. We may periodically send promotional emails about new products, special offers or other information which we think you may find interesting using the email address which you have provided. From time to time, we may also use your information to contact you for market research purposes. We may contact you by email, phone, fax or mail. We may use the information to customise the website according to your interests. You may choose to restrict the collection or use of your personal information in the following ways:whenever you are asked to fill in a form on the website, look for the box that you can click to indicate that you do not want the information to be used by anybody for direct marketing purposes. You may request details of personal information which we hold about you under the Data Protection Act 1998. A small fee will be payable. If you would like a copy of the information held on you please write to Martin Grover. This website also contains certain MartinGrover.com (or a subsidiary company) trademarks (whether granted or applied for), graphics, logos and service names ('Devices'). The Devices are owned exclusively by MartinGrover.com or a subsidiary and may not be copied or reproduced in any format (save as provided elsewhere in these Terms), or used in connection with any product or service without MartinGrover.com's consent. All other trademarks not owned by MartinGrover.com or its subsidiaries that appear on this site are the property of their respective owners, who may not be affiliated with, connected to, or sponsored by MartinGrover.com or its subsidiaries.